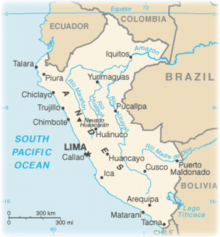 Additional Info: Peru is divided into three regions: The Coast, which features deserts, beautiful beaches and fertile valleys. The Highlands, a mountainous area dominated by the Andes, where Mount Huascaran soars to 6,768 meters. The Jungle, a large region of tropical vegetation in the Amazon River Basin, home to Peru's largest natural reserves. The Andes Mountains run parallel to the Pacific Ocean, dividing Peru into three geographic regions. The costa (coast), to the west, is a narrow plain, largely arid except for valleys created by seasonal rivers. The sierra (highlands) is the region of the Andes; it includes the Altiplano plateau as well as the highest peak of the country, the 6,768 m (22,205 ft) Huascaran. The third region is the selva (jungle), a wide expanse of flat terrain covered by the Amazon rainforest that extends east. Almost 60% of the country's area is located within this region. » Cordillera Blanca and Cordillera Huayhuash near Huaraz. The Cordillera Blanca (Spanish for "White Range") is a mountain range in the Ancash Region of Peru. It is part of the larger Andes range and includes 50 peaks over 5,500 metres (18,040 ft) tall in an area 13 miles wide by 112 miles long. - 10 to 14-day trek on the Huayhuash Circuit (Cordillera Huayhuash; difficult): The range has become noted for trekking in the form of the Huayhuash Circuit, which is considered quite a challenge and is undoubtedly far more demanding than the famous Inca Trail in the south of Peru. Fewer people trek the Huayhuash than the nearby Cordillera Blanca. The circuit generally takes between ten and fourteen days, depending on the route taken. Most of the walking, and most of the campsites, are above the 4000 m tree line, so the landscape appears rugged and mountainous, affording views over very wide areas. The area is noted for its spectacular glacial lakes. Hot springs can also be found in the area. Condors, llamas, alpacas and viscachas can be seen. 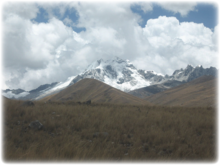 Trekking is almost always undertaken in the dry winter months of May to September, and the large town of Huaraz is the usual choice for a base, with Chiquian acting as the "Gateway to the Huayhuash". It is possible to penetrate into the mountains as far as the village of Llamac (3300 m), reached by road built in the late 1990s. - 3 to 4day Santa Cruz trek (Cordillera Blanca; moderate): With 33 summits rising over 6000m, Cordillera Blanca is the world's highest mountain range outside of Asia. The Santa Cruz trek is by far the most popular multi-day hike in the range. Here you can find pristine meadows, plentiful wild flowers, red quenua trees, turquoise lakes, white glaciers. It is important you be acclimatized before attempting Santa Cruz. - Choquequirao 5+ days (Choquequirao Trek to Machu Picchu): Choquequirao is preferred by some though it is not nearly so well known as Machu Picchu. Choquequirao is very different, however: different stone, different architecture including two-story structures, ritual baths, and gargantuan agricultural terraces. Hundreds of hikers a day sign on for the guided Inca Trail -see Machu_Picchu. It is easy to hire a guide or arriero (mule driver) and burros in the trailhead town of Cachora - it's best that you do! 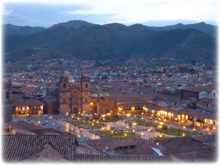 Cuzco, the Capital of the Incas, is the jumping off point for Choquequirao and Machu Picchu. - 5 to 6 day trek on the Ausangate Circuit - one of the highest, coldest, best hikes in South America: The Cordillera Vilcanota is an impressive range of mountains which include the massive Nevado de Ausangate (6,385m) and three others over 6000m. It has: spectacular mountain scenery, snow-capped peaks, hot springs, turquoise lakes, glaciers, herds of llamas and alpacas, picturesque villages and traditionally dressed Indians. It's also high, tough and cold, so be prepared. You will have more contact with the indigenous Quechua people, still brightly dressed in traditional costume. Many do not yet speak Spanish! Ausangate is a sacred mountain to these herders who believe this is where llamas and alpacas originated. Most hikers hire mules to carry food and gear but it is certainly possible to carry your own pack. You have the freedom then to camp wherever you choose. The best place for mountaineering in Peru is the spectacular Cordillera Blanca which is accessed from the town of Huaraz. There are plenty of peaks over 5,000m and an incredible 33 peaks over 6,000m including Huascaran which at 6,768m is Peru's highest peak. Huaraz is the largest town in the area and the most popular place to use as a base for exploring the surrounding mountains. There are many trekking and climbing companies in Huaraz that can help you plan your trip, provide suitably experienced guides and rent out equipment. However more serious expeditions should bring their own equipment. A great source of information can be found in the Casa de Guias (House of Guides) which is located in the Plaza Ginebra in Huaraz, where they keep a list of registered guides. Huascaran is a mountain in the Province of Yungay-Cordillera Blanca, part of the Western Andes. At 6,768 m (22,204ft), its southern peak (Huascaran Sur) is the highest in Peru and the fourth highest in South America. Huascaran gives its name to Huascaran National Park which surrounds it, and is a popular location for trekking and mountaineering. It is normally climbed from the village of Musho to the west via a high camp in the col that separates the summits, known as La Garganta. The ascent normally takes 5-7 days, the main difficulties being the large crevasses that often block the route. Best time to attempt this climb is from May to September. 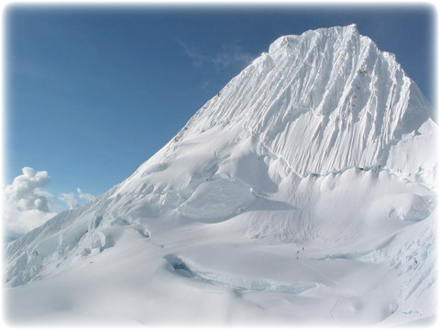 Alpamayo is one of the most conspicuous peaks in the Cordillera Blanca mountain range of the Peruvian Andes. 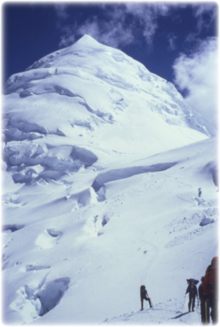 It is a steep (sixty degrees), almost perfect pyramid of ice, one of a number of peaks that compose the Santa Cruz massif, the northernmost massif of the Cordillera Blanca. Although smaller than many of its neighboring peaks, it is distinguished by its unusual formation and overwhelming beauty. It actually has two sharp summits, North and South, separated by a narrow corniced ridge. Its name comes from Quechua Allpa = earth Mayu = river: muddy river. In 1966, the Alpamayo Mountain was declared "the most beautiful mountain in the world" by UNESCO. The most common ascending path, known as the Ferrari route, is situated on the southwest face of the mountain. It was opened in 1975 by a group of Italian alpinists led by Casimiro Ferrari. It is considered a difficult climb, demanding good crampon and axe technique. The ascension rewards with incomparable views of steep ice faces, penitentes, gigantic white walls and ridges like those of Huandoy Norte, Artesonraju and Huascaran Norte, which mimics the finest of the Himalaya scenery. Cusco is most definitely the rafting capital of Peru offering popular 1 or 2 day trips on the Urubamba River and 3 or 4 day trips on the exciting whitewaters of the Apurimac River. Or for a really adventurous trip try the Tambopata River in Peru's south eastern jungle. 1. Huambutio to Pisac (Year round) - A good introduction to rafting with short and easy rapids which require no previous experience or special physical conditioning. It may be a little too gentle for some people especially in the dry season July-September, but the scenery is great. This trip is frequently combined with a visit to Pisac market and Inca ruins. 2. Ollantaytambo to Chilca Class III - Probably the most popular section of whitewater with the water being a bit more challenging with some exciting rapids. Novices can still make this run though. 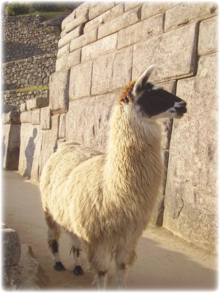 This trip is often combined with a visit to the Inca ruins of Ollantaytambo on the way back to Cusco. The putting-out point is usually Chilca which is only a 5 hours trek from the start of the Inca trail at Km 82. A few agencies therefore offer this trip as part of a combined 5-day rafting/Inca Trail package (Â½ day rafting, 4 days trekking and Â½ day returning by train to Cusco). 3. Huaran Class III + June-September - This section of the river is further along the Urubamba towards Machu Picchu and provides some sizeable rapids and fast whitewater. Prior experience of rafting is necessary and this trip is not offered daily. Check with a rafting company in advance to see if they are offering this trip. Day 1 - Starting at Cusco, it's a 5 hour drive west across the rolling landscape of the Andes down into the Apurimac River Valley. Raft down to the first nights camp, floating for about 1Â½ hours amongst class II, III and IV rapids. The camp is within a narrow gorge with sheer sides. Day 2 - You'll probably be rafting for about 4Â½ hours, mostly in Class III and IV rapids. There are some small sections of the river where you will portage the rafts and equipment. Camp on beach for the evening. Day 3 - This day you will experience a couple of class V rapids with names such as 'Tooth Ache', 'You First' and 'Last Laugh'! It's the most exhilarating day on the water probably spending a total of 3 or 4 hours on the river before camping the night on another sandy beach. Day 4 - The morning is spent quietly floating down to Cunyac Bridge and the Hot Springs of Cconoc before packing up and driving back to Cusco, arriving early evening. Day 1 - This day is set aside for getting to Puno. Day 2 - Early morning departure from Puno heading back on the road to Cusco, past Juliaca towards Azangarao, finally reaching Cuyo Cuyo in the afternoon. This drive provides great views of the cold wind swept 'puna' or altiplano where communities look after huge herds of llamas and alpacas. After Cuyo Cuyo the road drops down into cloud forest until you finally reach the put-in point at Putinapunco (2400m) on the edge of the Amazon Basin. Days 3-9 - The daily routine includes between 5 and 6 hours rafting per day with a few stops on route. The camps are usually set up on the beaches. Time may be spent scouting some of the rapids to check routes and water levels, since conditions can rapidly change from day to day. The surrounding scenery is pristine rainforest and you'll have the opportunity to see many animals and birds. You'll also encounter class III and IV rapids. There's abundant fish in the river. The group will be accompanied by an expert guide to explain a lot about what you see. Some trips may include small treks into the jungle. Day 10 - After a full day on the river you'll camp the night just before the Tambopata Macaw Lick (Collpa de Guacmayos). Day 11 - At dawn it may be possible to observe the magnificent display of bird life at the clay lick including the brilliantly colored and rowdy macaws. After meeting up with a motorized canoe you will travel past the jungle lodges of the lower Tambopata River until reaching Puerto Maldonado where you can spend a night in a hotel will. Mountain Biking is a relatively new sport in Peru, but new routes are rapidly being opened up, many of which offer excellent opportunities. If you are heading to Peru just for biking then it is advisable to bring your bike from home. If your plan to hire a bike then, as a basic rule, you are likely to get what you pay for. Although cheap imitation bikes are available from US$10-15 per day they are not likely to be up to the rigors of off-roading. A quality bike with front shocks costs in the region of US$20-25 per day. Make sure that you have gloves and a helmet, a basic first aid kit, pump and a puncture repair kit. The Callejon de Huaylas is a valley in the Ancash Region in the north-central highlands of Peru. Huaraz, the capital of Ancash is the largest city in the Callejon, located at 3000m above sea level. As you go north along the river at the valley floor, you pass through the cities of Carhuaz, Yungay (the site of a major earthquake and landslide in 1970 that buried the town and killed over 17,000 people), and Caraz, considered the last city in the valley. Pre-Inca ruins such as those at Chavin de Huantar, a relic of the Chavin culture which spanned 900 BCE to 300 BCE have been preserved and studied and provide a significant tourist attraction. The valley offers stunning snow-capped scenery and is located 8 hours by bus to the north of Lima. This part of Peru should be the number one destination for serious mountain bikers. Peru's most professional and experienced mountain bike tour operators can be found here, either in the popular city of Huaraz or in the pleasant little town of Caraz.